For the first weekend of February this year I got to have a little costuming adventure in Ft Worth, Texas. This was especially exciting as I’d never been to Texas before! And I have to say that what I saw of Ft Worth left a very good impression! It was so clean, the people were so friendly, the prices and portions for food were fantastic (even if the portion sizes were a little overwhelming) and the hospitality was overall so gracious! 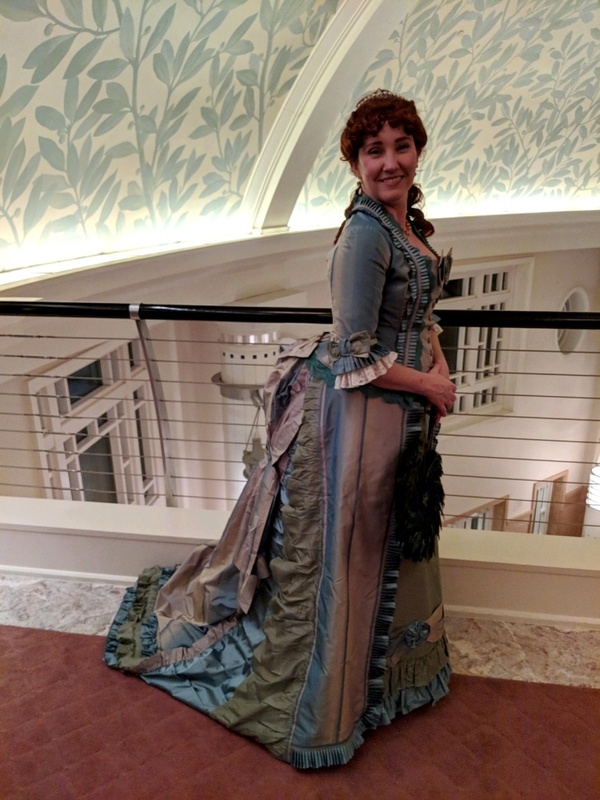 The reason for the excursion was an event organized by the Dallas/Ft Worth Costumer’s Guild, entitled the “Victorian Soiree.” They found out that the Ft Worth Symphony was going to perform a selection of pieces from the later Victorian era and decided to make an event of it! So, we went to the Symphony in costume and it was just delightful! I had initially planned to re-wear my CoCo 2017 Gala gown but have decided I don’t think the bodice is really all that flattering on me and I’m feeling self-conscious these days about my flabby upper arms. Add to this that an idea for a new 1870s bustle dress had been planted in my head by a silk purchase a few months ago and I couldn’t resist making something new – with sleeves, lol!